In Herrington’s wilderness survival courses, he teaches day hikers to pack a puffy jacket for warmth, and a 55-gallon trash bag for rain protection/shelter. Even in warm states. “If you’re wet—because it rains or you fell into water or you sweated through your clothes—and its 65 degrees, you can still get hypothermic,” says Herrington. “Texas is one of the leading states in hypothermia deaths, and look how warm it is there.” An injury compounds the risk of hypothermia by compromising the body’s ability to thermo-regulate. I have been able to find this image from the Washington Post. However, the image shades Texas a very light blue (almost white), instead of a dark blue, as is expected for a leading state in hypothermia (e.g. cold-related) deaths. My answer rests on publications by the Centers for Disease Control and Prevention (CDC). Apparently, the Washington Post also uses CDC numbers, even though I couldn't find the data set that they used to produce the figure. Before I get into details, just a word about the fact that Texas is one of the warmest states in the USA. If you look at average annual temperatures, Texas ranks fourth after Florida, Hawaii, and Louisiana. However, there are notable regional differences. During winters, cities such as Lubbock and Amarillo experience temperatures well below 0°C quite regularly. So, despite the high annual average temperature, regional conditions in Texas are varied enough that death by hypothermia is certainly possible. 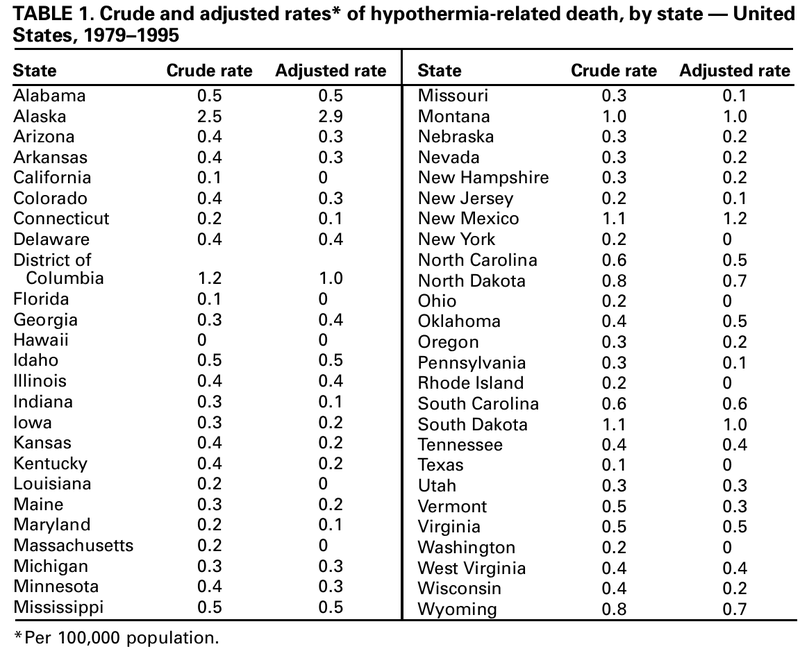 There is a somewhat old, but very useful CDC report from 1998 that contains a detailed table with hypothermia death rates for all states in the US. The table lists the crude death rates per 100,000 population. It also shows an age-adjusted death rate that takes into account that hypothermia is prevalent among older people (according to the report, almost half of the deaths were persons older than 64 years). Texas has a crude rate of 0.1, the same as California and Florida. Only Hawaii has a lower crude rate (probably, there were no recorded cases of hypothermia in that state during that time period). Of course, Texas has one of the largest populations of all states. It is not impossible that in absolute numbers, the number of deaths was higher than in other states with high crude rates but small populations. This doesn't appear to be very likely, though, as there are other relatively large states with higher crude rates than Texas, e.g. New York (0.2), Pennsylvania (0.3), and Illinois (0.4). These states have smaller populations, but not so small that it seems probable that the absolute figure for Texas was really higher than that for these states. Subsequent reports by the CDC do not seem to indicate a notable change with regard to the position of Texas. 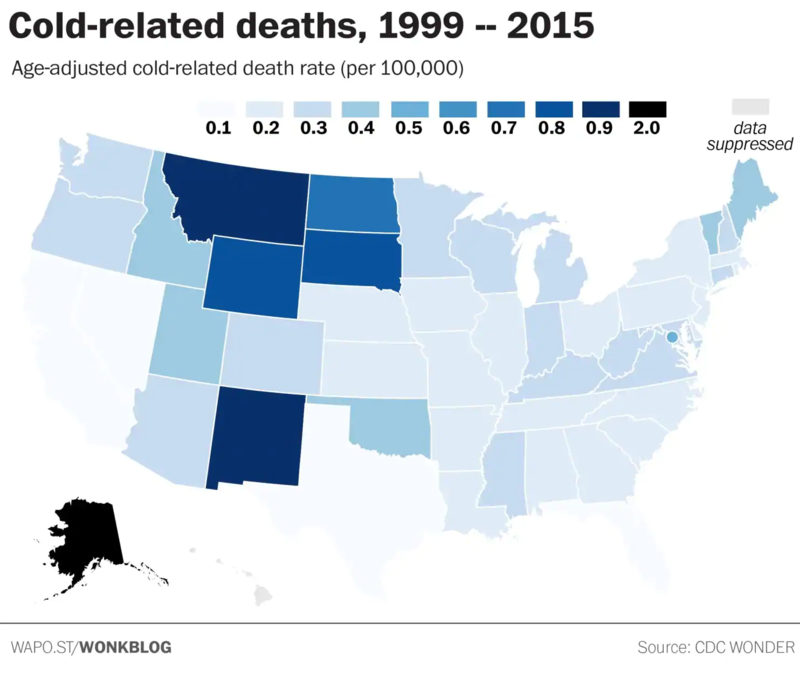 While there seems to be a significant increase of hypothermia-related deaths in the long term, there is no reason to assume that this increase caused Texas in particular to take the lead with regard to deaths caused by extreme cold. In 2006, the CDC published a figure that looks already very similar to the one that you link from the Washington Post. As in the Washington Post figure, Texas has the shade indicating the lowest hypothermia-related deaths. It is noteworthy that other states with relatively large populations like Pennsylvania have a clearly higher rate. So, to summarize: if differences in population are taken into account, there is no reason to assume that Texas is "one of the leading states of hypothermia deaths". 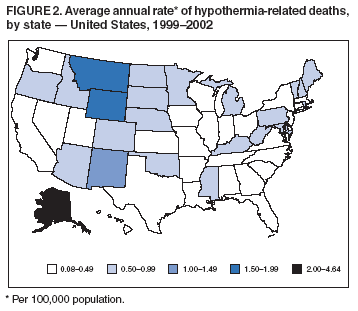 Due to its large population, the absolute number of hypothermia deaths may be larger for Texas than in states with a higher death rate, even if there will be states (e.g. Pennsylvania) with equally large or larger absolute numbers. Yet, basing the claim on absolute numbers would clearly be misleading. Not the answer you're looking for? Browse other questions tagged united-states physiology . Did a United States government official state that refusal to recognize the ICC was due to fear of George W. Bush would be prosecuted?